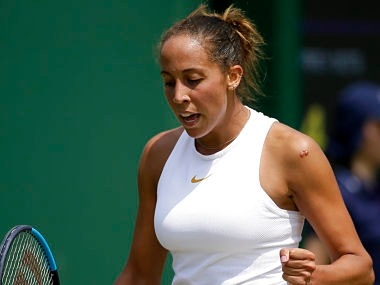 London: Madison Keys may possess one of the biggest games in women's tennis, but she admits that the power-packed men's game at Wimbledon leaves her cold. The 10th seeded American made the third round with a 6-4, 6-3 win over Thailand's Luksika Kumkhum on Wednesday. So far, the 23-year-old's serve has been clocked at 115 mph (185km/h), seventh fastest in the women's singles with Venus Williams leading the way on 123mph (197km/h). They are a long way behind Milos Raonic, the serve king of the men's event, who hit a top speed of 147 mph (236.5km/h) on Wednesday. The Canadian has also fired 52 aces in three rounds. However, they are the kind of statistics which don't impress Keys. "I'm going to be totally honest with you. I find it kind of boring, sorry," she said. "Just because it seems like they just hit like 312 aces a match, and, I'm, like, Wow that's a good serve. It's like 7-6 in the fifth and it's been like an hour and a half!" Keys, the runner-up to close friend Sloane Stephens at the US Open last year, made the quarter-finals at Wimbledon in 2015 but was knocked out in the second round last year by Simona Halep. That roller-coaster on grass sums up her relationship with a surface which fills just over a month of the tennis season between the European clay court swing and the US hard-court series. Keys first played on a grass court as a 16-year-old at the Maureen Connolly Cup in Eastbourne before competing at junior Wimbledon. "Everyone had told me I was going to love it and all that," she said. "But it definitely took some getting used to and I'm pretty sure I fell a lot the first couple times I was hitting on it." She is now just one of eight active women players to have won multiple grass court titles, at Eastbourne in 2014 and Birmingham two years later. Outside of the Williams sisters, who have 12 Wimbledon titles between them, Keys is viewed as the next likely US champion at the All England Club. "I think the biggest thing about grass is the bounce is just completely different," said the powerful 5ft 10in (1.77m) player. "You go from it being on clay where it usually is bouncing higher, and then all of a sudden the ball doesn't come up at all and you have to be a lot lower. "It makes my legs a lot more sore. And I usually have my coach in my ear telling me to get lower a lot more pretty much after every ball."